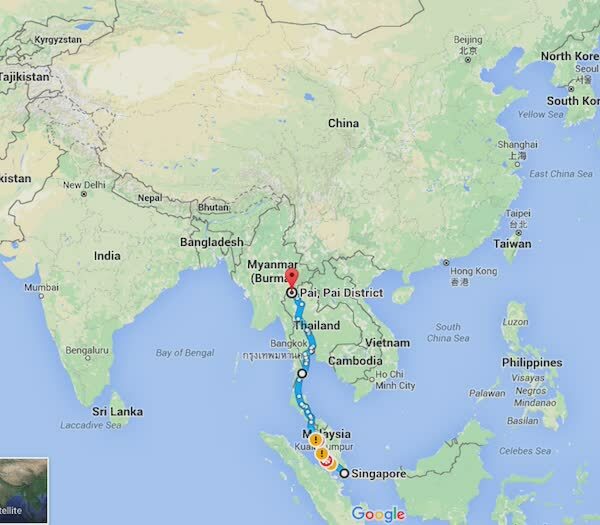 Singapore to Pai, Mae Hong Son, Thailand. As some of you would have known by now, my Pulsar 200NS engine died on me after I’ve travelled some 4,000 odd kilometers from Singapore to Chiang Mai, Thailand and around the famous Mae Hong Son loop. The troubles started surfacing when I was doing the Mae Hong Son loop, when the engine started acting strange. There was a loss of low-end power and the idling was very rough. 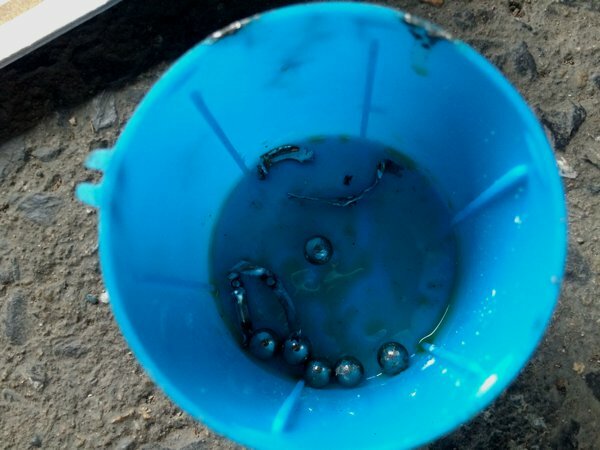 At first, I had thought that it was the widely available gasohol fuel I fed the carbureted 200NS – as ethanol and carbs are known to be not the best of friends. I would have loved to feed it pure petrol, but unfortunately, it is not widely available here in Thailand. Anyway, the engine finally gave up somewhere near Pai, and I had to tow the bike to Chiang Mai – the nearest major city – for repairs. Turns out that it was the camshaft bearing that failed catastrophically and the roller balls liberated from the bearing itself and made its way to the engine bottom and spilled out when the engine oil was drained. 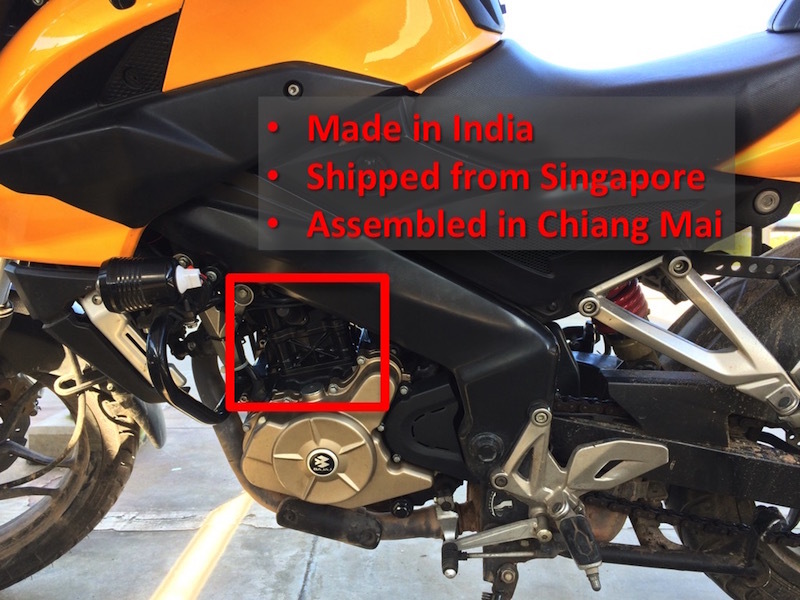 There was no Bajaj dealership in Thailand, and I had to order and ship the parts up from Singapore. The liberated roller balls from the camshaft bearing. The oil strainer caught the majority of the iron shavings. Because of the failed bearings, the camshaft lost its axis, and started hitting stuff all around the valve head. Eventually, the rocker arms, the camshaft itself, all 4 valves, and the piston and cylinder had to be replaced. Effectively, I now have something close to a brand new engine. The Pulsar 200NS spent 8 days in the workshop, including the wait for the delivery of parts. And since it was newly rebuilt, I had to run it in like how one would on a brand new engine. So the day after I collected the bike, I went on a trip for some 300-odd kilometers. While it was agonising to have to keep the rev’s under 5,000rpm for the first 500km or so, and thus doing speeds of somewhere between 60kmh to 80kmh on a highway, there were a few things I picked up from this newly rebuilt engine. The engine is now smooth. Silky, buttery smooth. It was a stark difference from the old engine. Perhaps because the last I recalled how it felt, it was already in a bad shape and was about to give up. The low-end rpm’s now have significantly increased power. I remember when I used to keep the rpms low, the engine will start to sputter when I released the clutch lever. No more of that now. The Pulsar 200NS now just seem eager to run – even at low revs. The engine choking or sputtering at around 4,500rpm is now gone. Perhaps this was the biggest improvement. Ever since I purchased the bike (I’m the second owner, and this is my first motorcycle), I have noticed that the engine tends to “choke” or “sputter” at a certain rpm. Also, whenever I released the throttle to slow down a little, and then start opening up to speed up again, I used to get a very strong jerk / sputter – strong enough to sometimes throw me a little off balance – especially around corners. Of all the issues above, the choking or sputtering used to bother me the most. I have done almost everything reasonably conceivable in attempt to rectify it – changed air filter (thought it was restricted), cleaned the fuel filter (clogged? ), added fuel system cleaners (rough fuel delivery? ), and even cleaned out the carburettor (got it serviced by the dealer). All no joy. And because this is my first motorcycle and the only motorcycle I’ve ridden, I had no prior reference, so I eventually gave up and attributed that choking / jerking / sputtering / roughness to it being a carbureted bike – well, a mechanical air fuel mixer probably ain’t as intelligent as a multi-sensor driven electronic fuel injection system, right? And then I had a sudden realisation. Any experienced bikers will tell you this about negotiating a corner – slow down before the corner, get in gear, and throttle up as you negotiate the corner. Because this choking / jerking / sputtering of the bike would sometimes throw me a little off balance around the corner, I’ve since adopted a different approach – slow down before the corner, get in gear, CLUTCH IN, THROTTLE PAST THE JERKING POINT, do a half-clutch (fully releasing the clutch too quickly would sometimes reintroduce the jerk) as I negotiate the corner. Effectively, I was momentarily FREEWHEELING around the bend! Because of the engine issue, I had inadvertently adopted an unsafe riding habit in attempt to adapt to the motorcycle engine’s characteristics! And this has been going on since the day I took delivery of the pre-owned bike! On hindsight, it wasn’t the fuel system, air filter or carburettor that contributed to the jerkiness at certain rpm’s that I’ve gotten so used to by now. It was actually a VALVE TIMING ISSUE. And I suspect that the camshaft had something to do with it – which by now, manifested catastrophically with a failed bearing. Oh yes, I’ve now re-learned to take corners with my clutch lever fully released and gear fully engaged on this rebuilt engine. Twisting the throttle at any appropriate gears now no longer give me that fearful jerk. I hope the engine stays this way. I still need it to take me home. 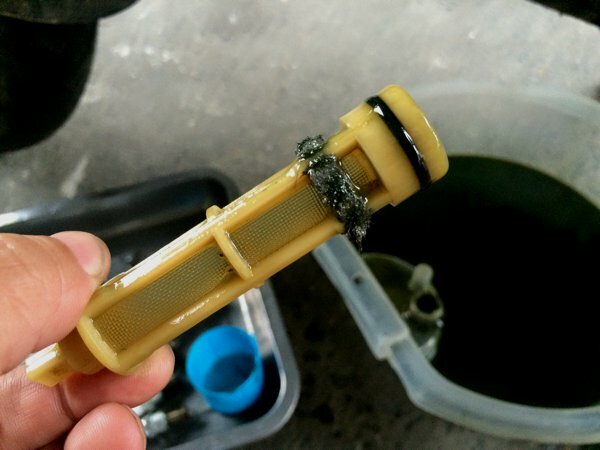 remember to change engine oil after run -in. my 200ns also does that same thing. runs on normal petrol. I am also facing the same issue which you were facing in my NS(Second Owner). It is jerky between 3000 -4000 RPM. Thanks for the heads up. I understand it correctly and now when I look back at my riding style I came to know that I am also not following proper steps and actually coasting a little bit in the corner. I will get my valve timing checked. One mechanic I think has screwed up my timing. Lets hope all get wells soon. I really love my NS. <3 <3 <3. Thanks, how much did the change cost you? You’re probably gonna get it a lot cheaper at your local dealer – Universal Motors if you’re in Singapore. I had to ship parts from Singapore, pay for shipping, pay for customs tax, and then pay for labour to a bunch of, although highly skilled, but unfamiliar with the 200NS mechanics.